1944: Fiona Denning has her entire future planned out. She’ll work in city hall, marry her fiancé when he returns from the war, and settle down in the Boston suburbs. But when her fiancé is reported missing after being shot down in Germany, Fiona’s long-held plans are shattered. Determined to learn her fiancé’s fate, Fiona leaves Boston to volunteer overseas as a Red Cross Clubmobile girl, recruiting her two best friends to come along. There’s the outspoken Viviana, who is more than happy to quit her secretarial job for a taste of adventure. Then there’s Dottie, a shy music teacher whose melodious talents are sure to bring heart and hope to the boys on the front lines. Chosen for their inner strength and outer charm, the trio isn’t prepared for the daunting challenges of war. But through it all come new friendships and romances, unforeseen dangers, and unexpected dreams. As the three friends begin to understand the real reasons they all came to the front, their courage and camaraderie will see them through some of the best and worst times of their lives. Jane Healey left a career in high tech to become a freelance writer. Her passion for historical fiction became her new career when her debut novel, The Saturday Evening Girls Club, was published in 2017. 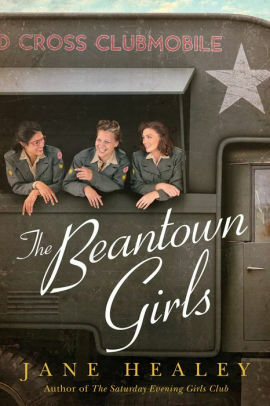 Based on the true story of a group of Jewish and Italian immigrant women in Boston’s North End at the turn of the twentieth century, the Amazon bestseller was hailed by Redbook as “a breathtaking ode to female empowerment and the American dream.” With the release of The Beantown Girls, she continues to fulfill her dream of writing about lesser-known stories of women in American history. She shares a home north of Boston with her husband, two daughters, and two cats, and when she’s not writing, she enjoys spending time with her family, traveling, running, cooking, and going to the beach.